: "When's the part where she loses her eyes?" "When's the part where she loses her eyes?" 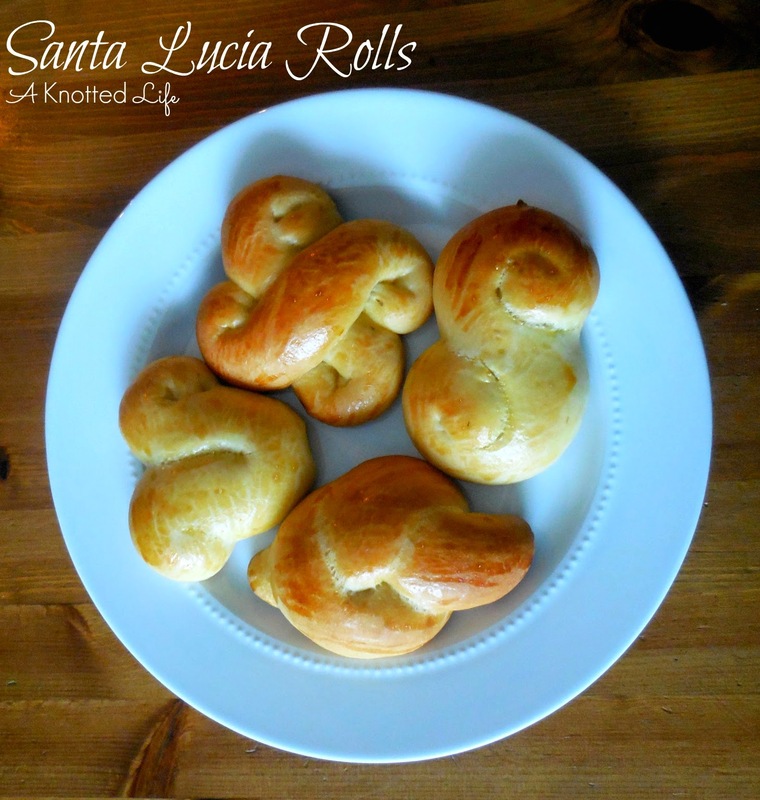 On St. Lucy's feast day (December 13th) I baked Santa Lucia rolls for breakfast. We lit all the candles in the dining room, including the ones on our Advent wreath, and plugged in the twinkle lights that are part of my mantel's decorations. I talked to the kids about St. Lucy, whose name means "light." I told them about the young Italian woman who was killed because she would not break a promise she had made to Jesus. I explained that in the Scandinavian countries, like Sweden - where my husband's ancestors are from - it is very, very dark in the winter and so they have always had a special love for the Saint of Light. I told them that in Sweden the families would all be eating Santa Lucia rolls for breakfast, just like us, in honor of St. Lucy. We discussed how St. Lucy's light reminds us of the Light of the World: Jesus Christ. Then L, remembering a lesson from her religion class, said, "She was the one who lost her eyes. Who took out her eyes?" Ben was never more fascinated. "Her EYES?! Someone took out her EYES?!!!" I tried to explain about torture, about martyrdom. He held the roll called the Christmas boar up to his eyes. "That would hurt! She couldn't see!" He's a five year old boy. "Her eyes!!!!??? .... .... .... .... ew." Later that day we chopped down our Christmas tree. After we brought it home and set it up in the living room I put in The Nativity Story to play in the background while we hung the ornaments. Ben looked at Mary, talking to the angel. "Is that the girl who loses her eyes?" "No, Ben. That's Mary, Jesus' mom. St. Lucy is the one who lost her eyes but that didn't happen until years later." A bit later he looks up at Mary and Elizabeth. "Is this when she loses her eyes?" "No, Ben. That's Mary, Jesus' mom. She never lost her eyes. You're thinking about St. Lucy but she's not in this movie." In the ever-loving stable, Mary has just given birth to the Savior of the world and Ben looks at the movie and says, "When is she gonna lose her eyes?" "NO ONE LOSES THEIR EYES IN THIS MOVIE!!!!!" You guys, at least the rolls were good. This post include affiliate links, which means if you shop Amazon by clicking through from my site I will make a teeny tiny bit of money, at no cost to you. LOL! :) That's cute! Hey, at least he will always remember that Saints are fascinating, especially the one(s) that lost their eyes! ;) Great fun on a special feast day! Haha this is great! Yah, sharing those parts are waiting for a little bit with my 3 year old. I can't even imagine all the ways he'd try to wrap his brain around it all and probably end up crying for BC he's kind of sweet like that. I imagine fun times ahead. He was already so sad that st. Nicholas (CCC cartoon) was imprisoned and talks about the mean guy a lot. Good one, Anne! This is classic. Boys are the best! LOL, sometimes they just can't let things go, can they? I laughed out loud when I got to "NO ONE LOSES THEIR EYES IN THIS MOVIE!!!" Such a Mommy Moment! The rolls look beautiful! Do you have years of experience shaping them?